2. Puppet is worked in continuous rounds, DO NOT join. Use a stitch marker to mark beginning of each round. 3. When crocheting into the chain, place your hook under two loops. 4. Octopus in photo was made with Red Heart Super Saver. 5. For eyes use wiggle eyes or puff paint if for a very young child. 6. If you want stuff the body with a small amount of Polyfill or a cotton ball. Finishing: Slipstitch in next 2 sts, fasten off. Weave in ends. With toothpick place 2 dots of Tacky glue on round 5, about 3/8 inch apart. Place eyes on glue. Let dry and enjoy. You are a LADY after my heart. I was the mom...way back when...that use to keep little wind up toys and toy cars and finger puppets and little toys in my diaperbag/purse. So when we went out to eat as a family he would be kept entertained. And not eating soda crackers the whole time. Of course there would be the bag of cheerrios too. Yes even way back then. LOL. My baby will be 34 this year. Keep up the good work and marvelous ideas. 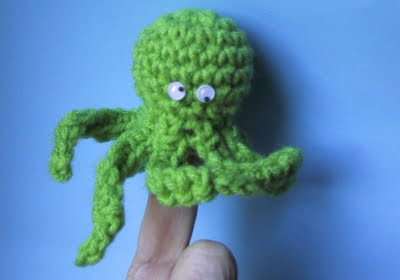 I made this finger puppet yesterday and totally enjoyed it - so easy and yet so cute. Hopefully my daughter will like it as well. Thank you for sharing your patterns. Great pattern! I just finished one, and will be making several more to use as treats at my daughter's upcoming second birthday. She's having an ocean themed party. Thanks! For a child of two I suggest making eyes by embroidering them on rather than gluing. I actually skipped the eyes altogether. The kids loved them. showed this to my friend and we've both decided we have to make these. I intend mine to go in a shoebox for samaritains purse. I would love to share this for fellow crocthers at church as well, who enjoy making things like this for charity. I always enjoy hearing people are using my patterns for charity projects. I am a beginner...as in this octopus was my second project! He came out soooo adorable! Thank you bunches for this pattern. Hi, I made an octopus last night, as something quick and easy after finishing my first granny square blanket. I found it easy to follow, and was really pleased with the resulting creature. I too, may well be making some for Samaritan's shoe boxes. Thanks for the great patterns. I may well be trying the Gecko bookmark soon too. I'm pleased to hear you will be making them for charity. Wow this is cool i Always want to do Dole for m'y hospital but i dont knit...but this is crochet Nice projet thanks to share i Will do with m'y left over yarn.